Taking care of your body is very important, your body is a temple and needs to be treated well. Fitness and eating healthy has always been important to me; but it became even more important to me after having kids. I wanted to get back to my pre-baby weight not only to look good; but to also feel healthy. After having Timothy I got right back out there are started working out again about 2 to 3 weeks later. I found that I didn’t have as much motivation as I normally had because I wanted to spend time with him; but I put in the effort, worked towards my goal, and it happened! I did mommy and me workouts, lifted weights on my own when he napped, walked with him everywhere (in bjorn or stroller) and snuck in yoga and Pilates whenever I could. I worked out and ate right. It took me 6 months to get back into shape. Living in NYC, I can walk everywhere and we would run around in the park as well. I found that even if I did five minutes, it made a difference. Four years later when I was pregnant with the twins I really watched what I was eating and exercised while pregnant. I also had a toddler to run after so that was a good motivation to stay fit while pregnant. I would do yoga and pilates workouts that felt good; and I modified poses as I needed to. After having the twins I not only had to lose the baby weight; but also heal my Diastasis Recti (DR is a split in the linea alba which is an aponeurotic tissue binding both sides of the abdomen together and keeps the rectus abdominis muscles in a functional unit) and that was a whole other issue. This time it took me more like 9 months to lose the baby weight and feel really fit again. I continued to eat healthy and move as much as possible. This time I did something different from my first pregnancy. I took some holistic diet supplements by Natureal. They provide an entire line of holistic dietary supplements to promote your health and wellbeing, no matter where you are in your journey, for a higher quality of life. Natureal’s products are free of harmful, unnecessary synthetics and their formulas are developed with real, wholesome ingredients. 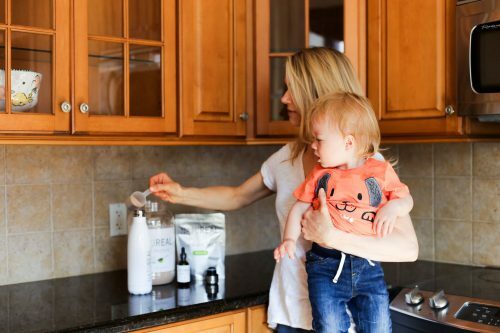 Understanding the importance of health education is key to the success of your diet supplement. Natureal’s mission is to educate and empower you to achieve optimal health by enhancing your lifestyle. They teach you how to restore your digestive health, identifying the best supplements, and teaching the ins and outs of fat and weight loss management, glycemic control and blood pressure management for results that last. I don’t supplement everyday but once in a while I drink some of the revert tea, it increase your metabolism and reduces the amount of toxins lurking in your digestive tract. I also use the revert drops that work together to support weight loss and physical performance. The drops help me feel more energized on days I’m dragging. I like to add the whey protein into smoothies in the morning, it helps get my digestive track moving. The protein is from high-quality proteins and amino acids that enhance stamina for peak physical performance. 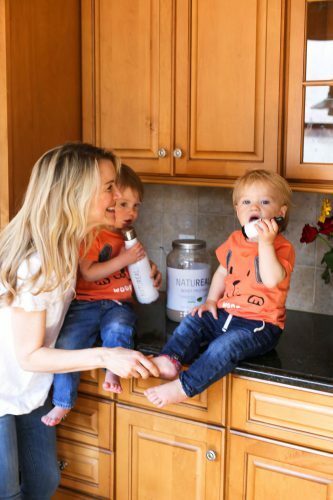 Use code kristin for 10% off Natureal products. Along with working out and eating healthy I do think it’s good to supplement when need be. I get the jumpstart I sometimes need to reset my metabolism and fuel my lifestyle. I make working out a family affair with all three boys. The boys are four and sixteen months, I cannot believe how time flies. I feel very strong and body confident; and I want to help all of you in your journey!